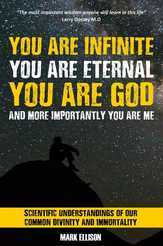 The book, You Are Infinite, You Are Eternal, You Are God: And more importantly, You Are Me is now available in kindle and paperback on the Amazon store. Buy it now, or enter your details below to download a free sample. Yes, I would like to download the free sample of You Are Infinite, You Are Eternal, You Are God. And more importantly You Are Me.